I'm back and still feeling the blessing of my sight, Shneep people! 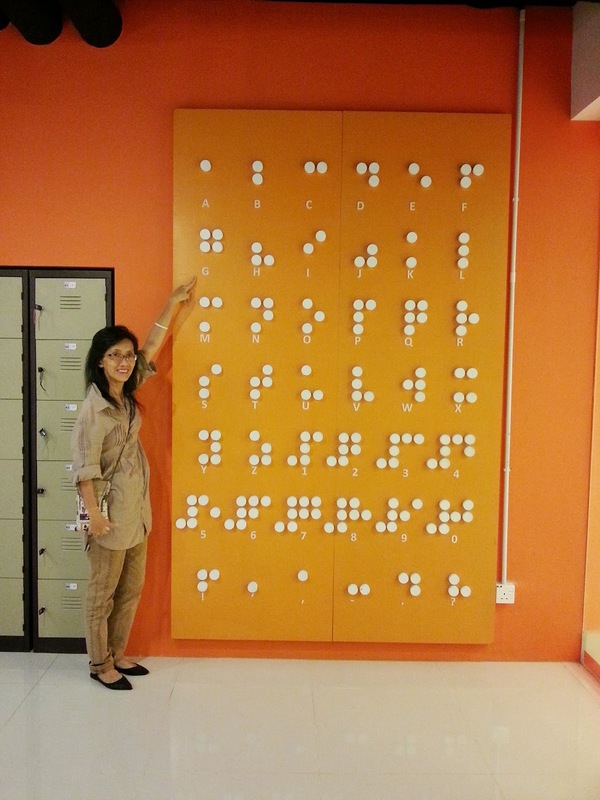 Yes, if you have already forgotten, I made a visit to Dialogue In The Dark in Jaya One last Friday courtesy of ChurpChurp who held the #ChurpOutInTheDark event in hand with Dialogue In The Dark to give us a sense of what it's like to be visually impaired. I must say that it was such an eye opener (No pun intended!) especially for someone like me who has always had bad eyesight. Mum's pointing at G, the initial to her name. I attempted an E but settled for a L...with an E in some way. Because of the experience I got at Dialogue In The Dark, I decided to also pen down what I've felt during and after the tour. And here goes nothing. While I had my mum who tugged on my hoodie all the way and all the other people who kept shouting over and over alongside my guide, Mimi, who was trying to help us around, I still could not help but to feel a little lonely in those times of darkness. It was almost like you just felt as though no one was with you and you were lost. Truth be told, this was the worse feeling to have while I was in the experience centre because there was no backing down and you couldn't speed anything up either for everyone was there enjoying it too. You just had to deal with it. I don't know if this was prominently happening to everyone else but when we all took a seat on the bench in one of the rooms and was told to "enjoy the breeze and surroundings", I closed my eyes and took in a whiff of what I knew for sure was air-conditioning but enjoyed it all the same as if it were fresh mist of the mountains we were told to imagine in our minds. Sometimes it is when we are out of sight that we put our brains into working out an image...without the image in front of us anyway. Freedom to express & the lack of self-consciousness. I know for sure everyone felt this. We could scream, shout, talk and do every other silly thing while we were in there without the need to worry about how anyone felt about us. We didn't even know who was doing what and that felt great. In fact, I had to tap on this participant named Jason throughout the entire tour and it didn't feel as awkward as I ever had to when playing ice-breaking games. It was just that kind of freedom in the dark that you felt and you could express it your own way. When the lights were turned on, we were all awkwardly silent and shared nothing but mutual smiles to one another at the same dining table. Before that, we were really engrossed in chats and tried to explore what was on our plates asking each other what we've found. And I thought that was great. You didn't care how the person looked and it didn't matter if they were fat or thin. All that mattered was that there was someone there to talk to and you were grateful for it. Coming back out to the light brought me more than just an experience but the art to be thankful. I was thankful for my gift of sight, I was thankful for the hospitality everyone from Dialogue In The Dark gave me but most of all, I was thankful to have been alive to see the world in all its beauty...or horror whatsoever be it. I think this is something that has come through everyone's minds when they stepped out from the dark. The loud sighs and relieved breaths were something you could definitely catch the night of #ChurpOutInTheDark. Factoring in the deal that I could see nothing, I put absolute trust in every sense of mine that night. I started listening in on how the blind stick hit other things like the wall or benches, I touched obstacles ahead of me and tapped on the person in front, I smelled things like oranges and lemongrass when we were walking around the "market" to feel what it's like to be out grocery shopping as a visually impaired person and I took to tasting each of my dinner's course with delicate care whenever Mimi served us a new plate of whatever. These senses; these everyday things that we have with us and take for granted suddenly came together as the most precious things ever. It's such an indescribable feeling, I can hardly put it in words. I just figure you really need to try it out yourself. 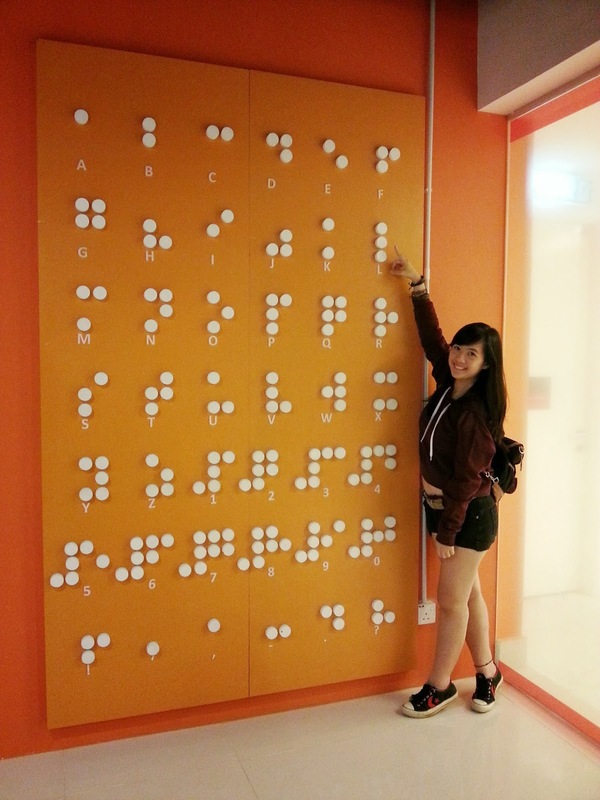 For the ones who are visually impaired, a grand salutation to them all. Not only did they guide us noisy bloggers and Churpers around the experience centre, they also had to take us to our seats for dinner and serve us meals while going up and down whenever we asked for extra tissue or drinks. And to think that we're the able bodied ones who have all of our senses perfectly intact! I absolutely think they are amazing after the evening at Dialogue In The Dark, not only during the tour but through their everyday lives when they are out of the centre. I know they won't see this, but I just had to try it out myself. Seriously though people, care for your eyes. Life as a visually impaired is difficult.